Original Art Stories: John Romita - Marvel Giant. 'Nuff Said! I must be getting more mellow in my old age as I decided to wait a fair while before I made any real comment about this book, but here we go. 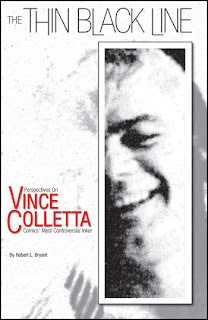 The Thin Black Line, released by TwoMorrows, is supposed to go a long way to reconcile inker Vinnie Colletta ‘s position within the comic book world and to rehabilitate his reputation. Colletta was known as an inker who took vast shortcuts overt his career, mainly due to some enormous deadline pressure, which saw the poor quality of his inking was often attributed to a lack of talent or ability. Let me get this out of the box straight away – Colletta had both talent and ability in spades. He was an accomplished penciller and would ink as well as anybody in the field whenever he wanted to. And therein lies the rub – more often than not he didn’t bother being as good as he could be.